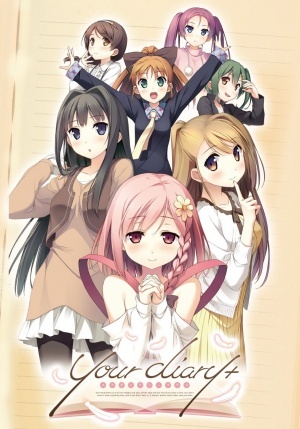 Your Diary is a visual novel series by Cube. There is a Furo session where Yua wears a Swimsuit to go Mixed Bathing with Tomoki Nagamine and ends up getting Intimate with him. There is a Mixed Bathing scene where Tomoki Nagamine shares a Bath sitting Back to Back with Yuuhi Minagawa who is Towel Bathing. Tomoki and Yuuhi have another mixed bath together where Yuuhi is wearing a towel on her head this time and is naked in Tomoki's lap and gets her breasts and crotch grabbed which then escalates to them getting intimate. Kanade Hirosaki is seen High Towel Wearing after some Off Screen Bathing. Kanade ends up losing her bikini top while in the water and is Partially Clothed Bathing but has it put back on by Tomoki. Yuuhi Minagawa blow drying Yua's hair after some Off Screen Bathing. An extended version of the original game that added a few more bathing scenes. Any bathing scenes that included Intimate Bathing in it were removed from the Playstation Portable version which was first released on November 28th, 2013. The fully uncensored version that includes all the bathing scenes from both games was released on PC on April 23rd, 2014. The first new scene is of Sayuki Ayase and Yua sharing a Bath together. There is also a Dream Sequence Bathing scene of Yuuhi Minagawa and Tomoki Nagamine having a Mixed Bathing Furo session. This page was last modified on 21 May 2016, at 14:22.